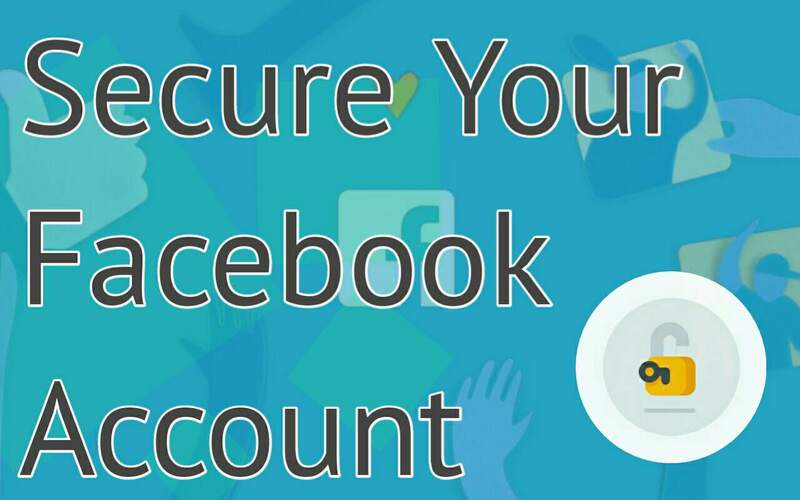 How to enable two factor authentication on your facebook account? Now a days approximately one billion peoples use facebook. And common question is How to keep safe your facebook account. Here the solution and method question How do i active 2 step verification on Facebook. 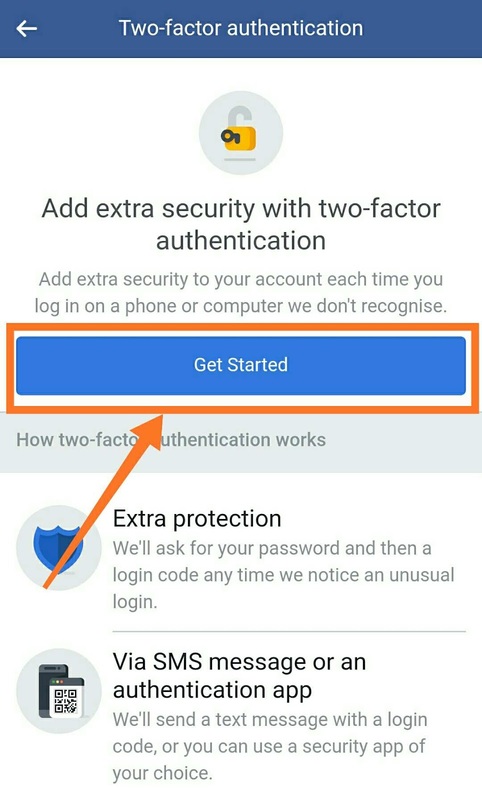 Here I'm explained the work function and algorithms with How to enable or disable two-facto authentication on Facebook. ◆ what is two factor authentication? 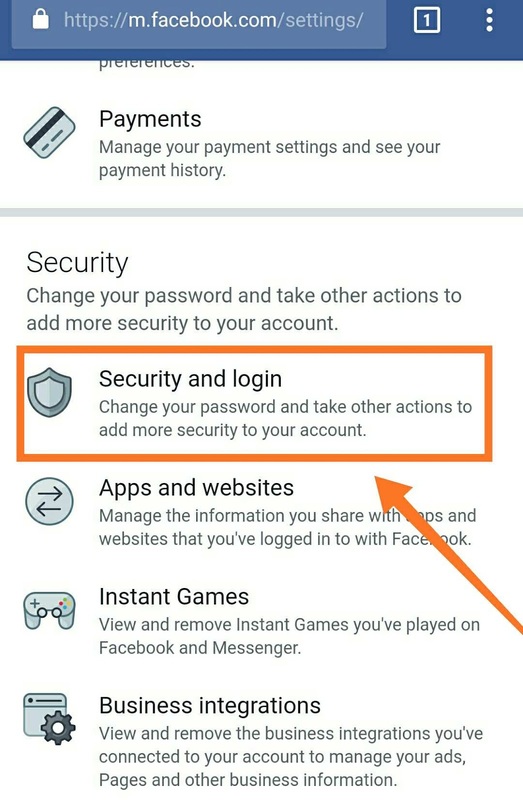 This is a security feature provided by facebook on personal account, that helps to protect your Facebook account in addition to your password. 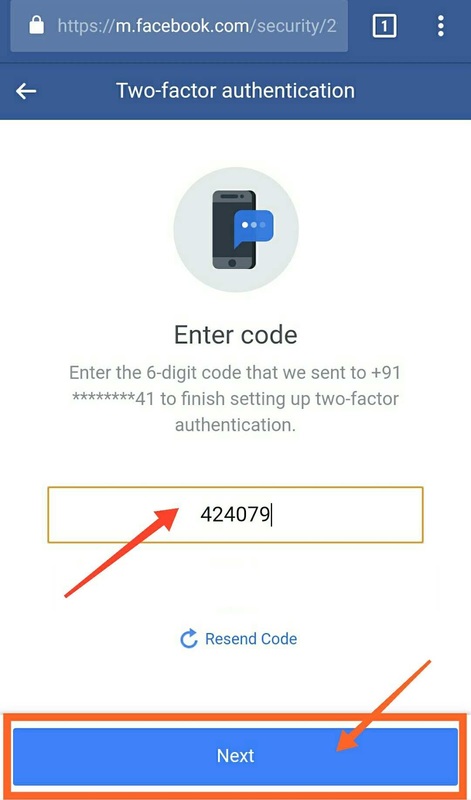 If you enable the two-factor authentication in your account , you'll be asked to enter a special login code or confirm your login attempt each time after typing pasword at the time of Log-in in new browser. Through messaging on your mobile number or Approval from other devices. 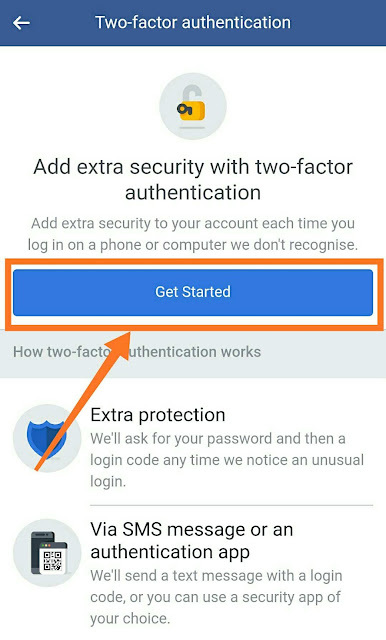 Two step verification on Facebook also support Google authentication. You can also received alert when someone tries logging in from a computer or mobile we don't recognize. Read more about two factor authentication on Facebook help forum. ◆ why we need to use two factor authentication? Firstly this feature is absolutely free, i.e no any SMS charge and no any other cost. Easy to manage, Anyone can Enabled and disabled it anytime. You can save two factors authentication in browser i.e Do not ask again in this device. The Maine one is, two factors authentication adds a new security layer on your facebook account. I.e whenever you try to lo gin, After filling the original password you need to verify once from an unique coed sanded on your mobile or google authentication app. 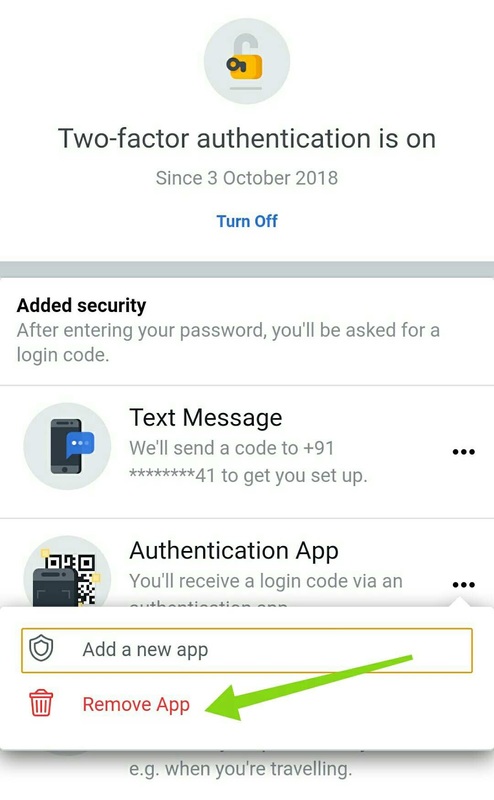 No one can access your account, even they know your facebook password. 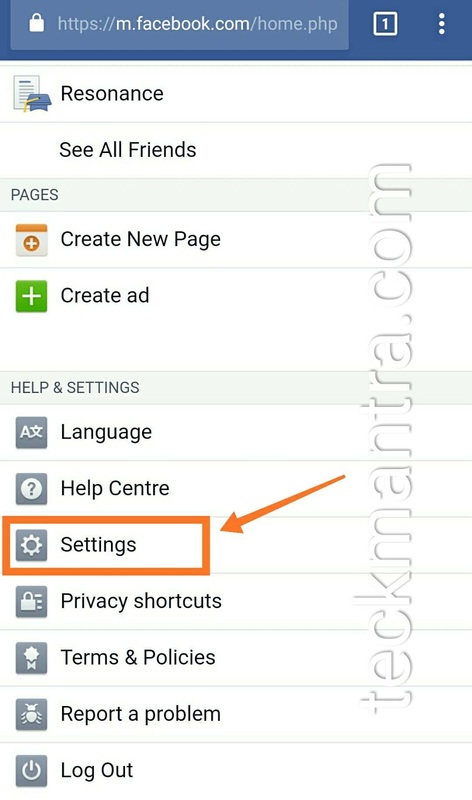 Here the step, you can edit settings in Feature by both Android phone or from Computer. 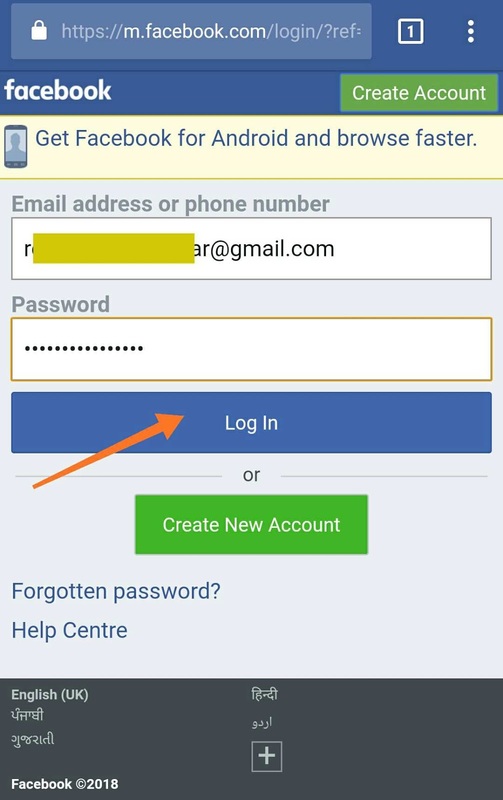 Step : 1 Log-in Your Facebook account. Here I'm using Chrome browser on an Android phone. You can easily do all same as on desktop. Click on three bar from upper right corner. 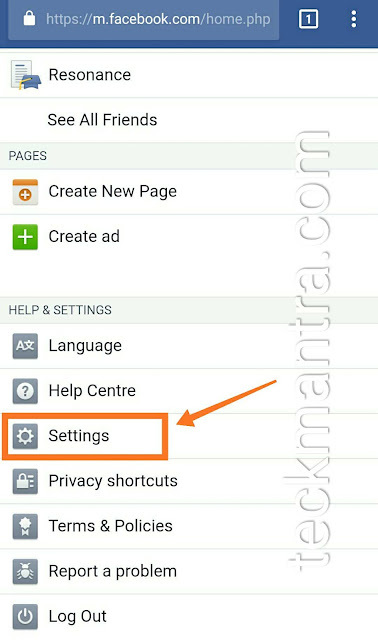 Step : 2 Scroll the screen and Click on Setting option. Click on Security and Log-in option inside. Step : 3 Scroll down the page and Click on Use two factors authentication. Step : 4 Choose a security method. Here you can choose two type of verification method. By using Google authentication App. Here firstly I'm Choosing SMS verification first. Click on Text message option for allowing two factors authentication through SMS verification on log-in from new browser. 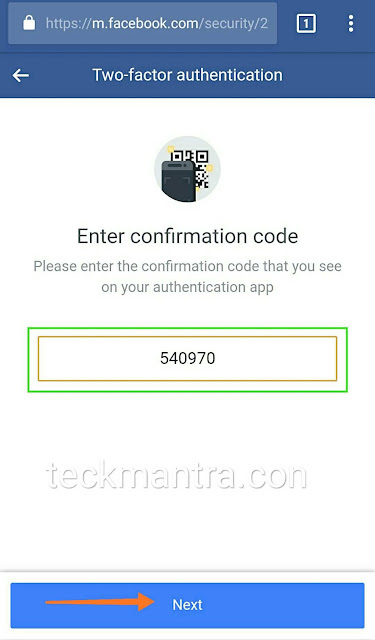 During the setup you got a verification code on your mobile number. Fill above and click on Next button. Step : 5 That's all, here you done the Complete setup fro two factors authentication through SMS verification. Click on Finish button below. ● Now the setup for two step verification through third party authentication App. Here I'm using Google authentication App. You can download and install the Apk from Google play Store. Step : 1 Use the same directory to setup through authentication app. Settings > Privacy & Security > Two factors authentication. Now choose through Authentication app. 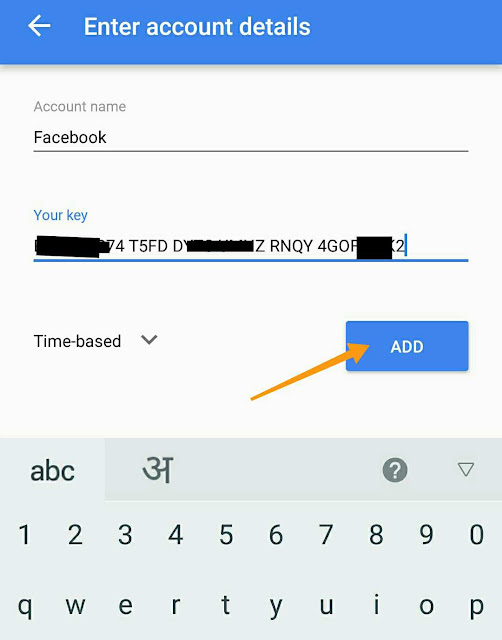 Now the time for do settings in Google authentication App. 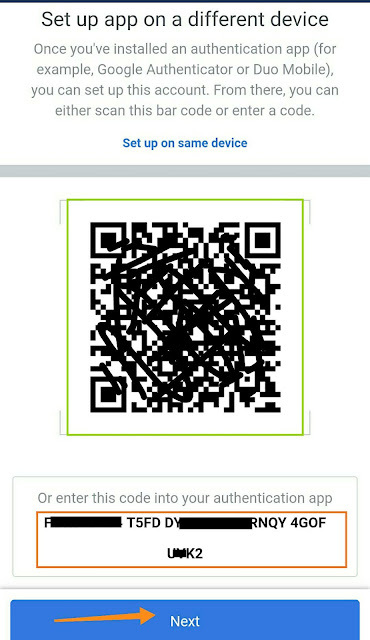 Copy the Code or scan the QR code from an Google authentication App. Step : 2 Open your Google authentication App (minimize your browser) and Click on Add an authentication. Past your code or Scan qr code for setup. 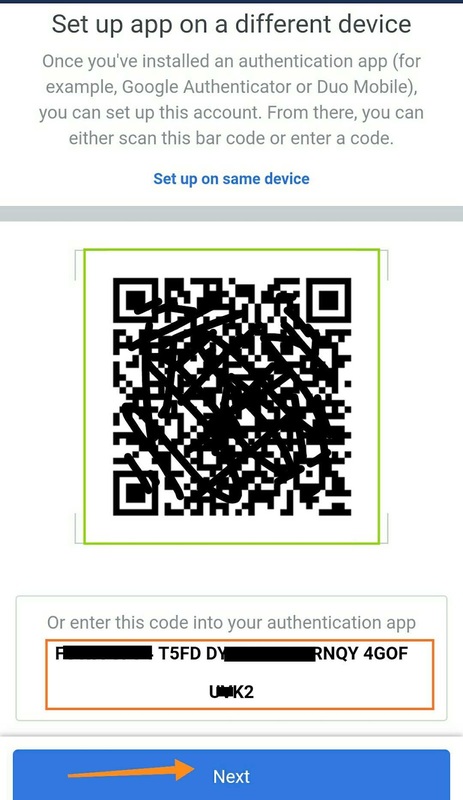 Here I'm going to copy the code, I am not able to scan qr code because here I'm using same device for setup. Step : 3 Click on Add button. Time based : Automatically generated and change in every 30 second. 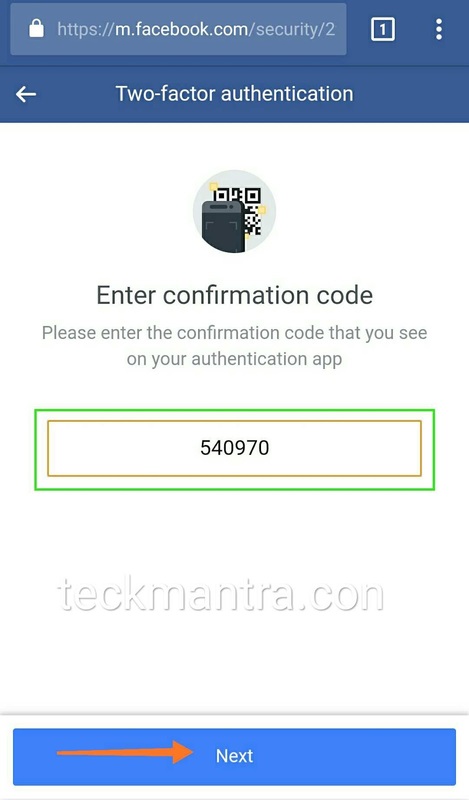 Counter based : Automatically generated on manual click in Authentication App. Here I'm selected time based Automatically generated authentication through Google's app on my facebook account. 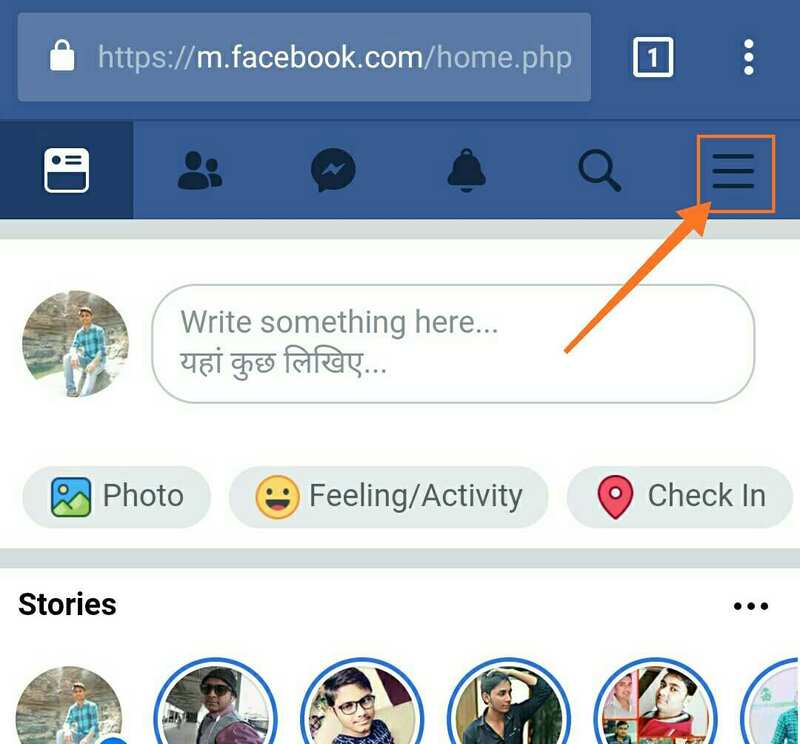 Now open your facebook from minimize tab, and type your six digits verification code from authentication App. And click on Next and Finish button from bottom of the page. That's All for setup two factors authentication through Google authentication App as well as through SMS on your registered mobile number. Now the time for add an extra security layer on your facebook account. Use any of method. You can also use both on same time. Click "More options" at the time of log-in. 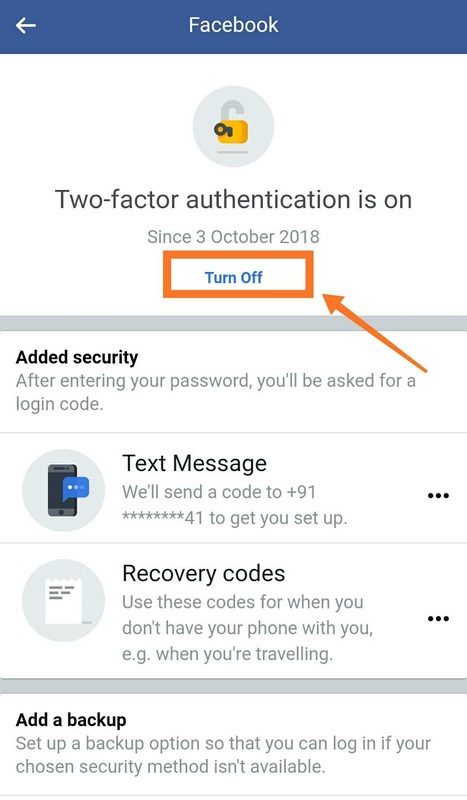 There are may reasons, people want to disable two factors authentication from their facebook account. 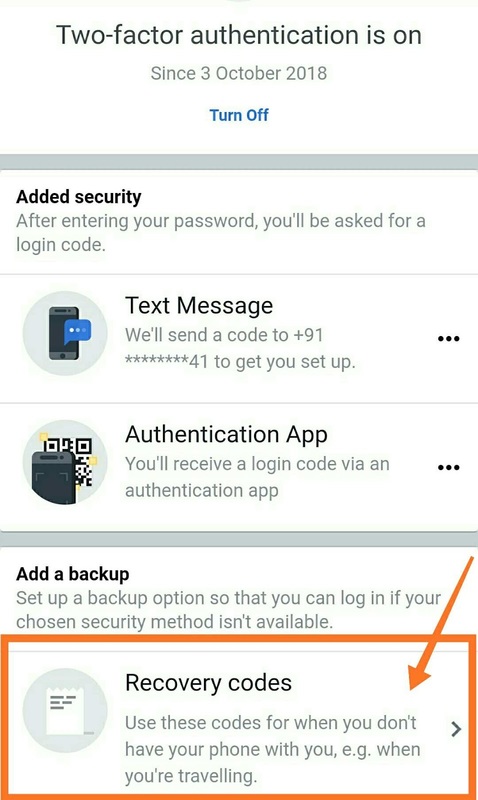 But before the reasons, facebook have a backup option see below. Another reason, people think my account is safe and i have no such data for loss. According to my opinion, two factors authentication is most useful Feature. you must have to use it. And the largest benefits is no one can log-in, even they know your facebook account password. 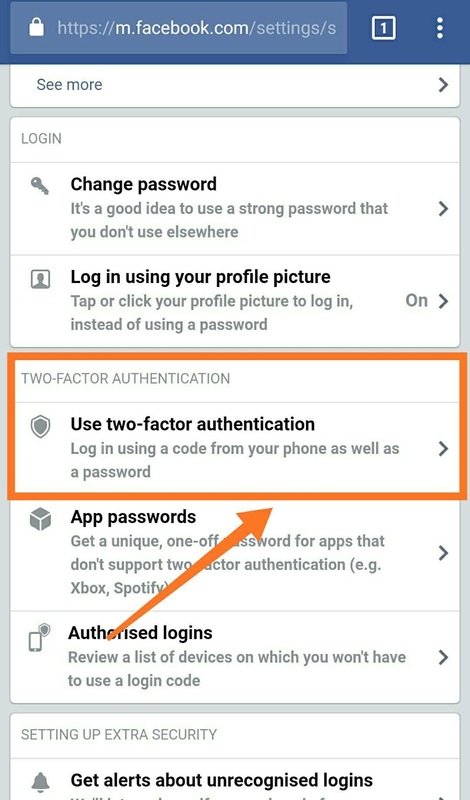 Here the steps fro disabled two factors authentication from your facebook account. 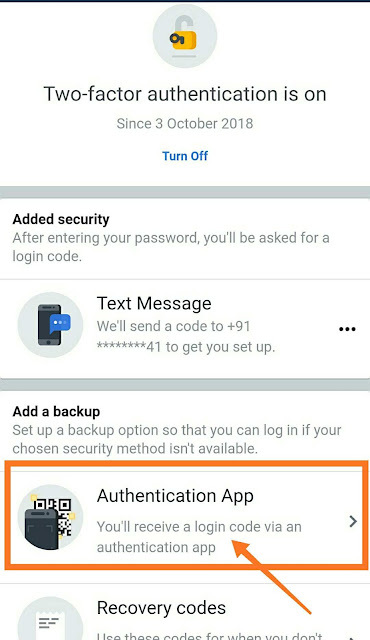 For removing Google authentication App only, remove the authentication app from account. 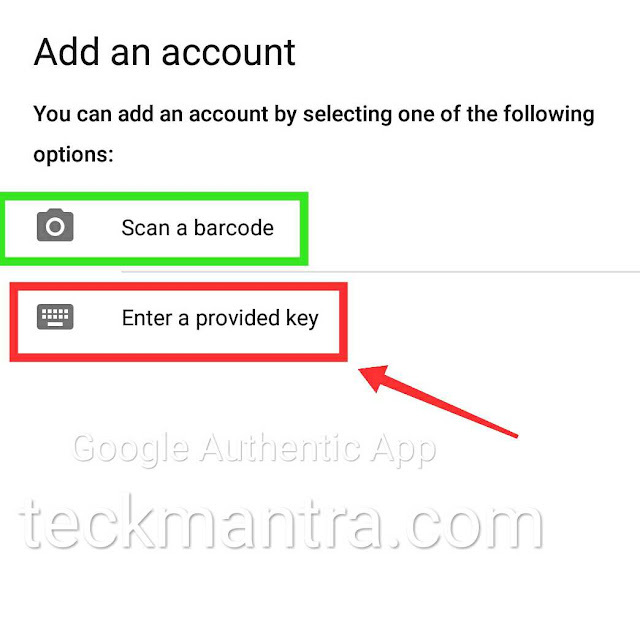 Click on Google authentication App and tap on delete App. 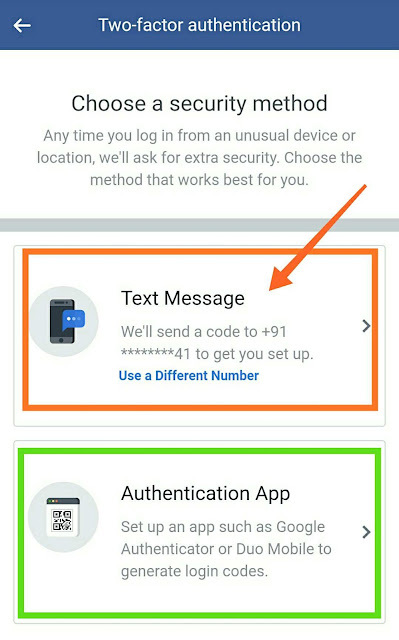 You can also disabled SMS verification too. For this go on same directory and tap on Turn off. That's all for Enabled and disabled two factors authentication on your facebook account. Through SMS and Google authentication App. May of peoples are not able to manage phone number or authentication App, even once i was on a trip, i have not my phone as well authentication App. 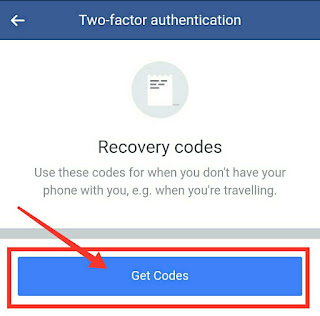 In such case you can use your Recovery code for log-in in your facebook account instead of two factors authentication. At the time of log-in tap on more options and choose recovery option. Or verify from other recognized device, where ypu are already log-in. And click on Recovery option. Click on Recovery code. 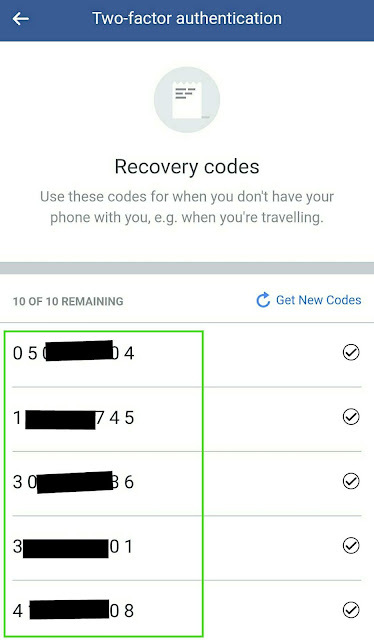 Here you got 10 recovery code and you can use any of them for log-in instead of SMS verification and Google authentication App. 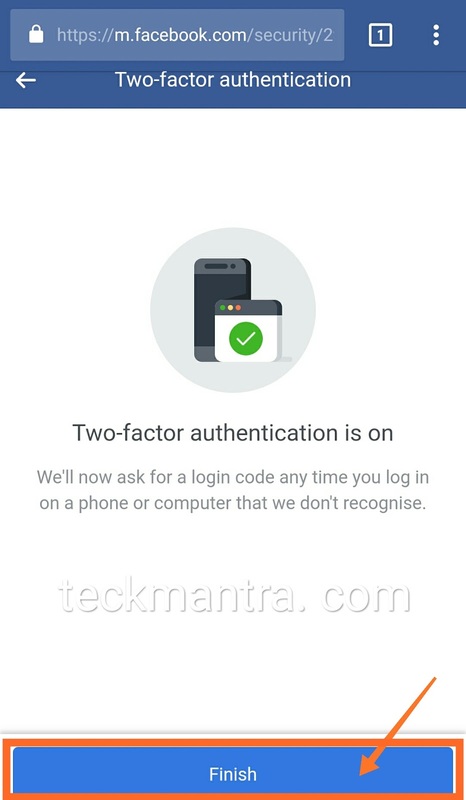 That's all for setup two factors authentication through SMS verification and Google authentication App. Including disabled option with backup or Recovery option. So, what you think Go and secure your facebook account and feel more complicated. Conclusion : You all know facebook account is in risk, if someone have access of your account. 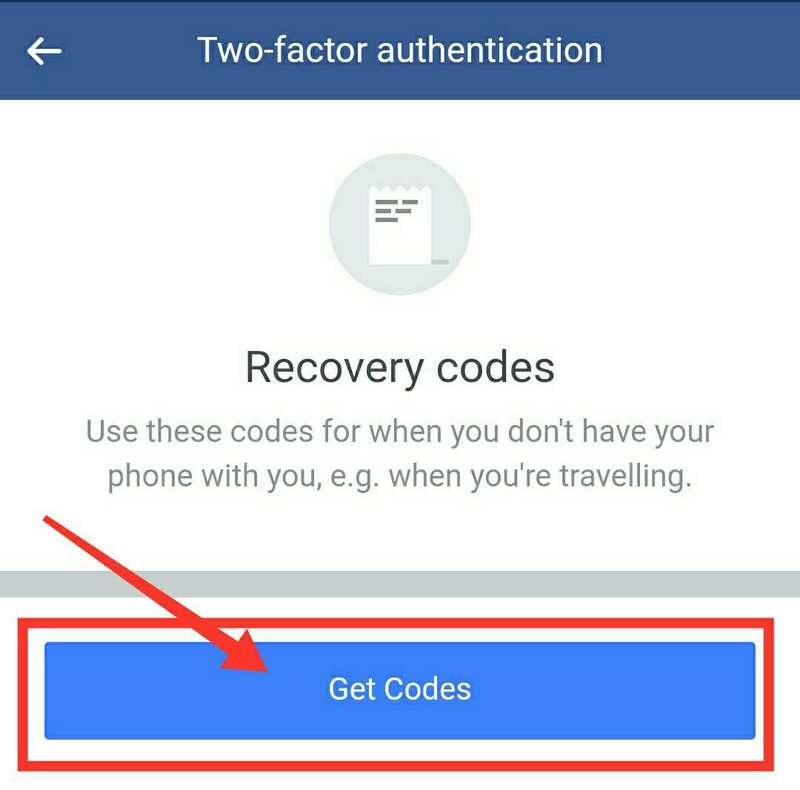 Here I'm explained How to enable and disabled two step verification on your facebook account with recovery option.